Roleplayers are creatures of bizarre habits, not all of them good. What follows is a quick follow-up to my last Player 101 piece with a few more tips on how to behave to maximize fun at the table. This is a blatant lie that players tell each other when they realise that they’ve said something stupid. 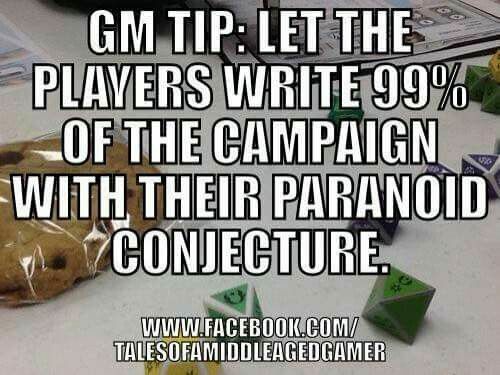 It’s often said that a DM can use the paranoid conjecture of his or her group, and this theory works rather well in practice. For example, does this exchange sound familiar? All the while the DM is thinking of how to work an ambush into the future without doing so exactly as the group expects. Maybe they should trust “that guy” but he’s about to be ambushed too, or perhaps the ambush comes later, once “that guy” has their trust. Or maybe it would have been a normal room if you’d kept quiet, and now there’s a trap somewhere weird. Or just perhaps the trap that was in this room that you all failed to spot is now “suddenly” in another chamber, one where your guard is down. You can’t help yourselves. I can’t help myself when I play, because as I’m playing I’m thinking of all the terrible things I would be doing and thinking. Please enjoy the mantra “don’t give the DM ideas” because you are your own worst enemy, much like trying not to think of a pink rhinoceros when your told, as a player you’ll tend to blurt out whatever detrimental thought pops into your head. There may come a time where Rule 0; Because I’m The DM must be used in order to make a story element work. The sad fact of the matter is that no rulebook covers everything, and a good DM will inevitable conjure something that no rule supports and therefore must “cheat”. Now cheating in a roleplay is a very flexible term where houseruling is a common and encouraged practice. Indeed most guides on running games will include a few suggestions on alternative styles of play, rules you may want to add, alter, or ignore, and fresh errata every so often when commercial release dredges up some flaws in the system that weren’t ironed out in testing. Ultimately the only rule that needs to be followed is Rule 1; Fun Trumps Rules. In situations where one or other of these rules come into effect it’s best just to go with it. The moment you raise the question or start quoting rules you’re going to start eating into time that people could have spent taking part, or you could overturn an attempt at building an atmosphere that would have made the next part of the adventure more enjoyable. I am an atheist. But I believe in the dice gods, and I know that they like me a lot more behind the screen than in front of it. This is something that I find amazing amongst role players. It doesn’t matter how suspicious, superstitious or otherwise ritualistic they are in any other aspect of their life, sitting at the table those dice have minds of their own and they have already made up their minds about you. This is a phenomenon known locally as “the dice gods”. Dice gods like some people a lot, conversely there’s always someone at the table who never gets any luck, or perhaps it seems that way for months on end and then their luck suddenly changes permanently for the better! Someone else at the table must have earned their ire. Don’t borrow dice: Nor should you lend dice, even if you’re lending dice that traditionally hate you, they’ll love whoever you pass them to, and then hate you worse when they come back. Bring food: I’m not certain why this works, but bringing snacks to the table seems to have some kind of placating effect on dice. 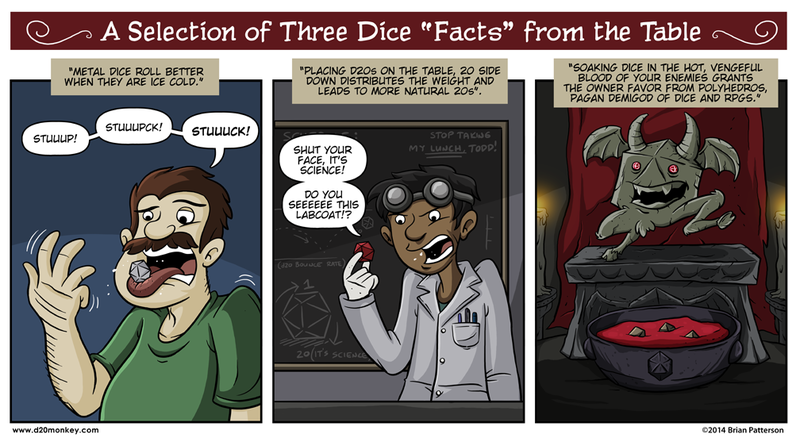 Accept fate: Once the dice have resolved to hate you, no matter which ones you use, stop trying. Don’t swap dice again, don’t roll a bunch of dice and see if they’re actually capable of rolling higher, it’s just your time. Your character might live through the game, just be brave, and try again next time. This entry was posted on July 30, 2015 by terraphi. 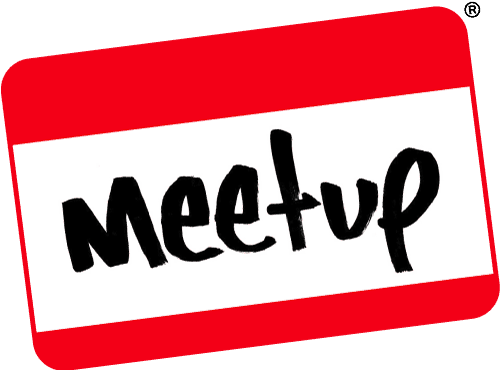 It was filed under Gaming posts, RPGs, Traditional Gaming and was tagged with advice, dice gods, DMing 101, don't give the GM ideas, etiquette, Gaming, Pen and paper, player, Players, Quotes From The TableTop, RPG, TableTop.